Ace actress Suhasini sparked off a controversy at a 'O Kadhal Kanmani' aka 'OK Kanmani' press meet in Chennai where she stated that only qualified people should review her husband Maniratnam's movie OK Kanmani. However, the actress remarks have drawn flak from various quarters, including social media. "Just like only qualified persons can act, do cinematography and musicians like A.R.Rahman who knows music can compose, only qualified people should review the film. Of late, everyone who has the basic knowledge in computers, has started writing film reviews. Professionals shouldn't let that happen. Madras Talkies has been producing quality films for the last 23 years and only professionals should review Ok Kanmani," she said. 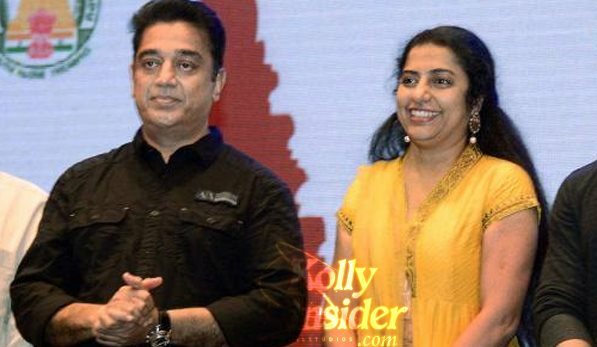 Meantime, in an interview with a weekly magazine, when asked about Kamal's opinion on Suhashi's statement, Kamal replied that "If you are giving tickets to everyone to watch the film, they can review it too. We can't do anything with such criticism, also we should not stop such critics... Meantime there is nothing wrong in Suhasini expressing her thoughts". Regardless of Suhasini Maniratnam's statement and controversies, the online and video reviewers did their job as usual after the release of the movie, critics were good and praised the movie and the director. However, some reviewers claimed that it is inspired from Hollywood's "Friends With Benefits". Kamal Haasan is awaiting the release of Uttama Villain on May 1st. It will clash with Aishwarya Dhanush’s Vai Raja Vai at the box office.